Some of the small towns near Rome (e.g. Tivoli) offer to the traveller a sort of concentrated sampling of the history and monuments of the Eternal City. This applies to Vienna too. Perchtoldsdorf is a small residential town at commuting distance from Vienna, but it is still surrounded by vineyards and woods; it has retained the atmosphere of its old days and several monuments of its past. Perchtoldsdorf is almost entirely made up of the houses around its large market square and along a few short alleys departing from it. It served both as a trade and military post being located to the south-east of Vienna on a route protected by a series of medieval castles. The market square offers a fine view over the (much re-Gothicized) Parish church, the Turm (defensive tower) and the Pestsaule, the three main monuments of Perchtoldsdorf. The inhabitants of Perchtoldsdorf, who were in the region of maybe 1,500, were able to erect in 1714 such an elaborate Pestsaule by using the shrewd and practical mentality of peasants. It is said that they bought part of the statues and reliefs which decorate the monument at very low prices because they had been rejected at a competition for the Vienna Pestsaule. This theory is supported by the fact that the main relief shows Vienna and not Perchtoldsdorf being freed from the pestilence. The fortifications of Perchtoldsdorf were not limited to the imposing square tower, built between 1450 and 1521, but included walls surrounding the market square and a castle, located on the top of the hill, which served as the baronial residence. Martinikapelle is a small chapel adjoining the castle: it was built between 1512 and 1520 and it shows the persistence in the countryside of Gothic patterns during the Renaissance. 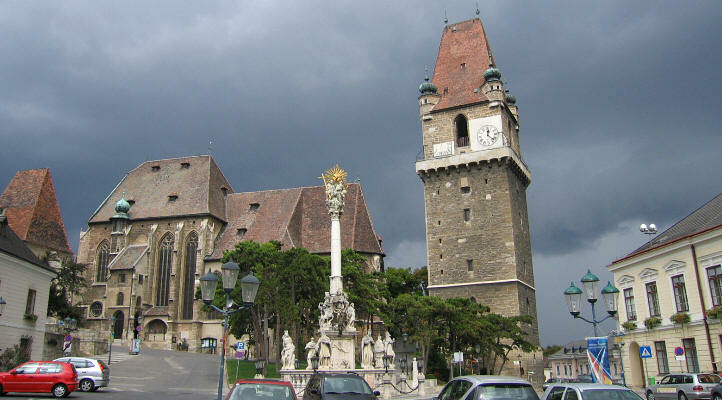 The fortifications of Perchtoldsdorf proved effective during the first siege of Vienna (1529), but they failed to be so in 1683. Apparently the citizens of Perchtoldsdorf were not sufficiently training in musketry: they made a gallant sally, but fired their weapons all at once; then they had to recharge them, but the Ottomans did not give them the time to do it and Perchtoldsdorf was sacked and many inhabitants were killed. So (rather dramatized) reminders of the 1683 events can be found in several places of the small town. This occurs sometimes also in Italy: the image used as a background for this page shows a monument celebrating the battle of Lepanto in Marino, near Rome. Spitalskirche is an early XVth century Gothic church which owes its name to a now lost hospital. Knappenhof is a small XVIIIth century residence which shows that the Baroque patterns developed in Vienna spread to the countryside. This style of yellow painting is called after the Empress Maria Theresa, who had a predilection for it: in Italy it is called after the town of Parma, because it was brought there by Marie Louise, the Austrian archduchess who was the second wife of Napoleon and who was given in 1815 the Duchy of Parma and Piacenza.